In January this year we were in the process of finding the con's mascot, and ended up having two! a bull and a lynx. 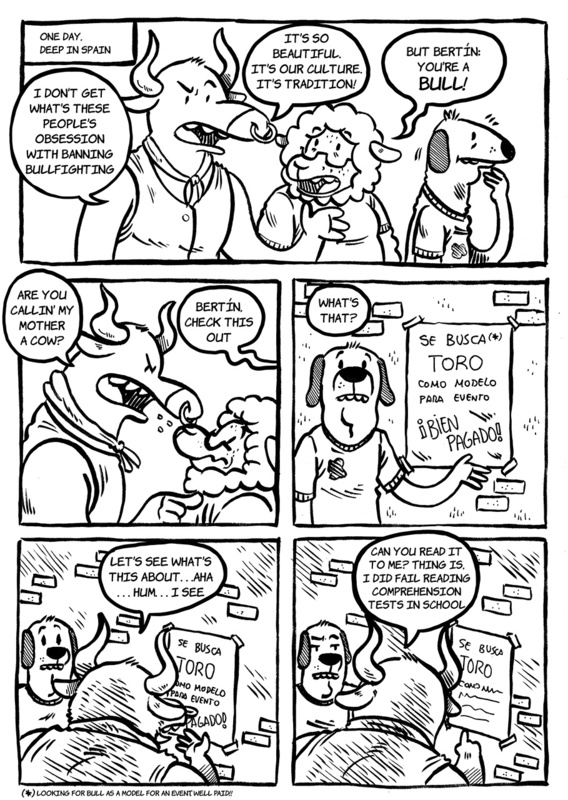 One month later, great spanish comic artist rayfkm made us the first 'fan art' ever, a parody comic about how our mascots became so. The first 5 pages are the english translation, the last 5, the original text in spanish for those interested. If only I still lived in Espana....or the EU for that matter...I would sure love to attend. It'd be cool that you did! Where are you now? The US. Texas. But hey, I still get to practice my Espanol! The US. Texas. But hey, I still get to practice my Espanol! That's a plus, verdad? Totally! Will you come here to live and work again in the future or you don't see it happening? I do want to. I REALLY want to. Just need to save up the funds. I wanna go to you're convention and hang with you! But I'm poor and you will probably be to busy hang with. I'll see how bad plane tickets are. Jajajajajajajajaja esta cómic hizo mi dia. "Either you do it or you're fired" awesome XD also who is you and S Cheetah???? I'm the one sitting down, and Sierra is the one holding the 'policies' and not letting go! Why do i find the secretary hot?